You’re probably familiar with the Best American annual anthologies, which compile the year’s best writing in topics ranging from science to sports to comics and mystery stories (these have saved my holiday-giving bacon year after year with difficult-to-shop-for relatives). There’s even one for infographics, which I’m not sure counts as “writing.” But one category the Best American series doesn’t include is food writing. Fortunately, the Best Food Writing series picks up the slack, and the 2014 edition features 400-plus pages of tasty bite-size treats. 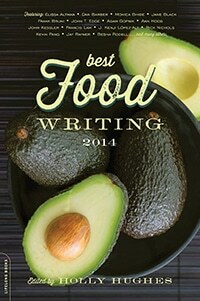 Dozens of food writers, chefs, authors, and bloggers contributed to this collection, which compiles articles, essays, excerpts, and blog posts. Most of the selections are fairly short pieces that are ideal reading for your daily commute or when you’re stuck in a line (waiting for a table at a restaurant, perhaps?). They run the gamut from very light humor pieces, like a satirical blog post advising hipster foodies on the Pinterest-perfect way to boil water, to more serious and in-depth journalism, like the story that follows a month in the lives of an African-American family attempting to survive in Detroit on food stamps and food banks. Likewise, the offerings range in quality. Some of the blog posts, in particular, are pretty dashed off and unpolished, and don’t seem to belong in any kind of “best writing” anthology. The collection would have been stronger if these essays had been omitted or at least revised for a more polished presentation. I appreciate that the editors are trying to present a broad, less elitist range of voices, but including poorly written blog posts may actually undermine that goal. Some of my personal favorites include “The Science of the Best Chocolate Chip Cookies,” by J. Kenji López-Alt, an exhaustive journey into the sometimes-obsessive mind of the serious foodie in pursuit of perfection; “Last Meals,” by Brent Cunningham, a study of the public nature of executions and our gruesome fixation on prisoners’ last meals; and “A Toast Story,” by John Gravois, a smirking tale of $4 artisanal toast that turns unexpectedly poignant and sincere. If you enjoy these essays, you’ll get a good sense of what this anthology offers. Overall, this is a varied and satisfying collection with plenty of thought-provoking long-form journalism and fun, colorful pieces on food and cooking. An excellent holiday gift for foodies, home cooks, and print-loving relatives who might not have seen these essays online.